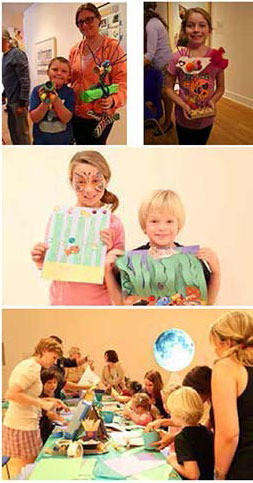 As part of MY HERO’s mission to promote arts education, the Gallery conducts workshops with hands on hero art activities at museums, schools, afterschool programs and community festivals. The MY HERO Gallery participated in the 2014 Orange County Imagination Celebration at the Laguna Art Museum. With the help of participating families, MY HERO designed and created a mural Be a Hero Keep Our Oceans Safe & Clean! with the help of families visiting the Explororcean Museum on Balboa Peninsula, as part of the Newport Beach Imagination Celebration. The MY HERO Gallery hosted a RECYCLED SHOREBIRDS art project in conjunction with our partner Laguna Art Museum’s Art & Nature Festival. The hands on-craft was inspired by the MY HERO short film THE BIRDMAKER by Cheikh Seck from Dakar, Senegal. The MY HERO Art Gallery is grateful to Americans Who Tell The Truth, The Art Miles Mural Project, and Peace Pals International who have contributed their vision to our website.